Today begins the Hindu observance of Navratri, a nine night celebration of the nine incarnations of the warrior mother goddess Durga. 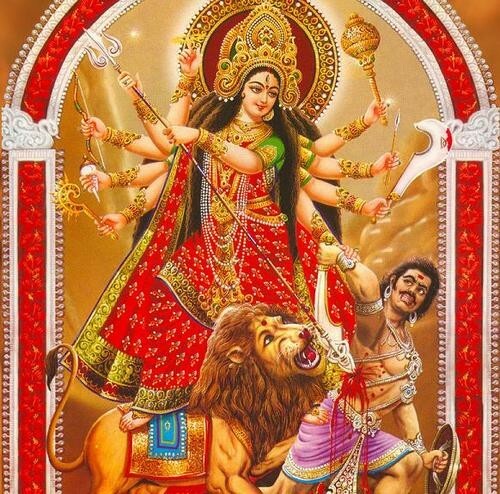 It’s hard not to see the similarities between Durga Mata and Oya the goddess of the wind, whose sacred number is 9, who accompanies Shango in battle, who is the divine assurance of change. My limited understanding of Hinduism is that the goddess is seen as the active manifestation of the masculine, the feminine is the energy that activates, urges the god into action. As the wind blows outside my window this morning, I pay homage to all warrior woman energies and I encourage all my sister friends to tap into their Shakti power today and everyday. Don’t ever apologize for being awesome! And I’m so bored of all these Western feminists talking about how unnecessary men are. That is a pile of tata and if we don’t have a balance of masculine and feminine energies we will never progress as a civilization. And to my brothers and male friends and lovers past, present, future, I ask that you not fear the power that women possess. Give us the space and love to embrace our wildest selves when necessary. There are too many other battles to fight for us to be engaged in battles in our romantic relationships. I can live without a man, but I don’t want to. We all need to just love each other a little more. Men women and women men. Love without the power tripping. Love of the community and the mission that stops the obsessive focus on one person. Let’s not forget that the largest demon that Durga slays is the ego. Durga Mata ki Jai! Iba se Oya!